Environmental public hearing held for Greenfield Holongi airport, public hope no political interference any more. 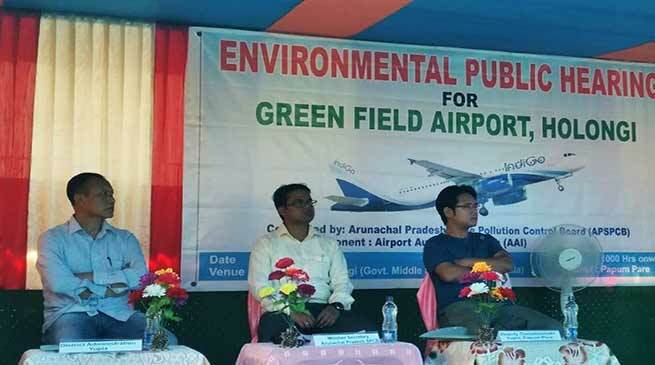 The Environmental Public Hearing for Greenfield Hollongi Airport was conducted by the Arunachal Pradesh State Pollution Control Board, Naharlagun in collaboration with district administration of Papumpare at Govt. Middle School Ground, Patila, Hollongi today. While addressing the public, the Deputy Commissioner Dr. Joram Beda, appreciated the public for their enthusiastic participation and said that every state capital in the country are connected through Airport except Itanagar and it is dream of not only the people of Hollongi but every single citizen of the state to see our pristine state connected through airport and to make it happened we must give our full support for early construction of Green field Hollongi Airport. He also informed the public that Environmental and Forest clearance are two important procedures as per the guidelines of Govt of India for taking up any big projects. Responding to the public queries he also informed that environmental public hearing is purely for environmental clearance and for land acquisition related matters district administration will conduct separate public hearing on land acquisition in near future. Airport Authority of India, North Eastern Region, Guwahati, D.S Gariya, General Manager (Engg-II), gave a brief presentation about the project focusing on the Environmental Impact Assessment (EIA) and Environment Management Plan (EMP) of the Green Field Airport Hollongi. He also clarified the concerns raised by project affected public and said that coming up of airport project will not only change the socio-economic status of the region but will also see the growth in tourism sector too. Meanwhile, Land Affected Forum, Secretary Likha Teji, and other project affected families and public expressed their full support and welcomed the project whole heartedly in the interest of the development of the State. Member Secretary, Arunachal Pradesh State Pollution Control Board(APSPCB) Navneet Kumar Srivastava while briefing the media said that ‘we received the draft report on environment assessment, we have to organise public hearing and minutes and report is being sent to the Ministry of Environment & Forest (MoEF) within a day or two which would be put up to expert legal committee, the ministry after receiving the minutes of the meeting and concern of the affected people. Few concern of the people was cleared by the officials of the AAI and District administration. Public were positive and want airport in the area and the mood of the people was also happy. Srivastava added. Kara Tajang a local leader of the area said that it is a welcome step but there should be no more political interference in the sad project. The people of state want this project for last more than 15 years and it would have been completed much earlier but due to politics it have been delayed. Balijan Additional Deputy Commissioner Tasso Gambo, DLRSO Yupia, Nabam Nakap Hina, Yupia and other officers and officials from District administration, AP state pollution control board, project , Airport Authority of India, affected families and general public were present on the occasion.